The Nam Tok Than Mayom is in the jungle on the east coast of Koh Chang in Thailand. About two kilometer after Dan Mai village you will find the small road to the waterfall. 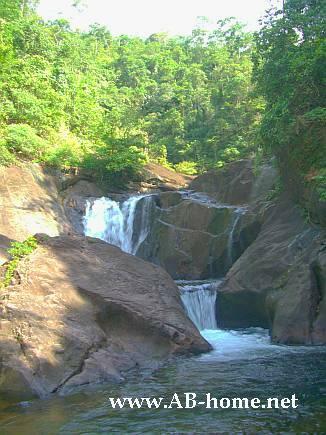 The area were the Than Mayom waterfall is belong to the Mu Koh Chang National Park. The admission fee was 200 Thai Baht in October 2008. 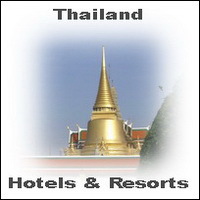 For the present fee please read the Lonely Planet Thailand or ask at your hotel or resort. The easiest way to get here is by motorbike. Taxis are rare on this side of Koh Chang in the Gulf of Thailand. Close to the Than Mayom is a private parking place. They charge small money for park. From here it’s a walk of about five minutes threw the tight jungle. If you are lucky you will see some wildlife like butterfly’s, spiders, monkeys, birds and snakes on the way to Nam Tok Than Mayom. This Waterfall is for me the most beauties on Ko Chang. Actually there are two, the water falls down first in a small pool before a second small but nice waterfall runs into a big natural pool where you can swimming. Don’t forget sun creme, towel and swimmwear if you want to shower under the tropical Mayom waterfall. Drinks and food you can bring or buy at Dan Mai village near the public hospital of Koh Chang. In fact it’s a very beautiful waterfall.